Crowdfunding is a mixed bag, at best. On one hand, you have fantastically successful products like Pebble, Oculus, and the Kano personal computer that managed to take in money, turn out a product, and become a successful company. (If even just for a while, the Pebble was great.) On the other hand, you have obvious scams like a color-picking pen that are run by a literal Nigerian scammer. Crowd Supply is different. Unlike other crowdfunding platforms, to get on Crowd Supply you’ll need a working prototype. Where other platforms can measure their success by how many campaigns were successfully funded, and how many of those campaigns successfully delivered rewards to backers, I’m not aware of any Crowd Supply campaigns that have ever failed completely. 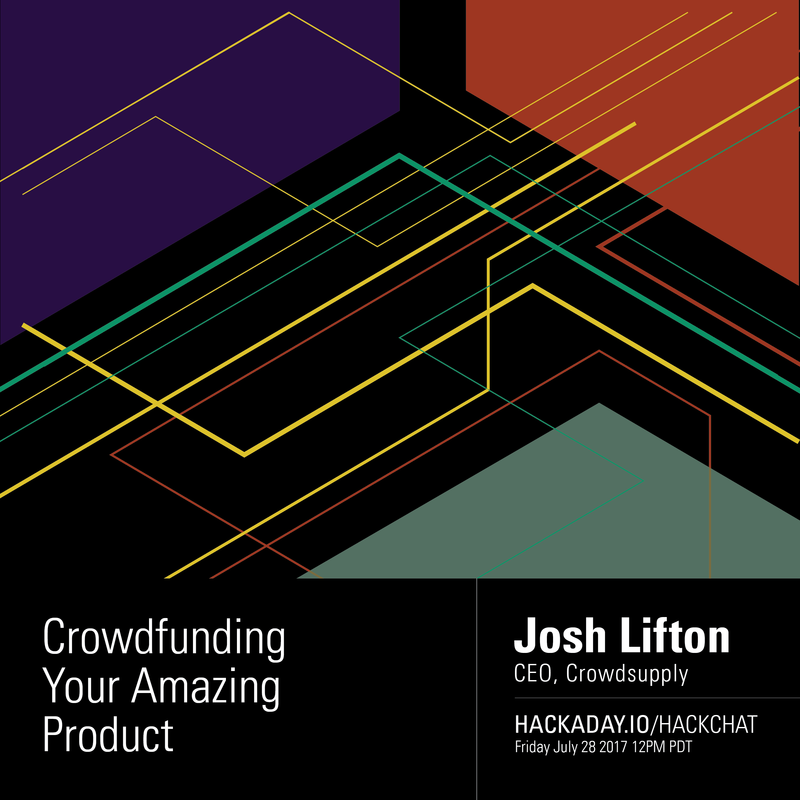 For this week’s Hack Chat, we’ll be talking with [Josh Lifton], CEO of Crowd Supply. Topics will include determining if there’s a market for your product, the ins and outs of fulfillment, to shipping your product. We’re taking questions from the community, and there’s a question sheet we’ll be reading from. Josh has a PhD from the MIT Media Lab and holds a BA in physics and mathematics from Swarthmore College. Prior to Crowd Supply, Josh worked in a variety of technology settings, from instrumenting thousands of audience members with custom wearable computers for a Cirque du Soleil performance to, most recently, serving as head of engineering at Puppet Labs. Our Hack Chats are live community events on the Hackaday.io Hack Chat group messaging. This Hack Chat will take place at noon Pacific time on Friday, July 28th. Confused about where and when ‘noon’ is? Here’s a time and date converter! Why can’t they raise the same production capital as the hype sites? Hint: Normal consumers see unpackaged parts as garbage…. and Crowd-Supply is 99% unpackaged parts (having a >50% China drop-ship module inventory is not something you should be proud of at all). Unless you have over $400k already to push a minimum volume, than Crowd-Supply is just another low-volume wholesaler looking for inventory on credit. It is unlikely even 1 of these crowd–funded companies is still around in 3 years given the economic position is ridiculous. *Keep in mind I have launched several companies, and most are still in a profit-mode. These not only have been around for more than three years, they’re selling on Amazon now. Bunnie is not domestic production, as he literally wrote a book on the subject of shipping product from Asia. For every example, how much of the seed capital came from the Crowd-Supply stream? I may exhibit troll like symptoms, but it is actually issues the site owner will need to address if they wish to remain relevant. People (often backyard tinkerers) have designed these “drop-ship modules”, and crowd supply has helped them to fund their initial production run, I don’t see why you’re so upset. PPS. Do your companies run chat sessions to share knowledge with the community? To be blunt, the board doesn’t care about $100k of low hanging fruit. if the mentioned company survives more than a year, uses a different GUI from identical power supply LCD units from China, and can sustain a market while meeting compliance rules. >Do your companies run chat sessions to share knowledge with the community? As a board member, I cannot directly engage the public without consensus. When a company grows, the founders must eventually step away from the primary operational rolls either by choice or by force. We only care about paying customers, as the rest of the population is unfortunately irrelevant for a business. Good luck kid, and may the VC be with you. > As a board member, I cannot directly engage the public without consensus. Yet here you are ;) Come on, name your companies so we can see for ourselves. You seem to be saying that unless something is a sustainable multi-million dollar company, it’s not worth doing at all. Don’t you have any hobbies outside big business?? A lot of these projects are just spare-time things, without crowdfunding they would maybe make 2 or 3 for their friends at cost price. With crowdfunding, they get to learn some scale-up things, and maybe make a few thousand dollars. Sounds like a win to me. I think I understand your point, but an LLC is not really a full corporation. And I prefer to keep as much of my gains as legally possible… as you can’t spend egos. No they won’t, people don’t need automated marketer’s service fees if they already have viable inventory. The site simply externalizes production risks onto the user base, exposes a fledgling business to the open markets, and hedges against operational losses with hype. Finally, if you think bit-coins are a real currency, than there is nothing I can teach you about commerce.